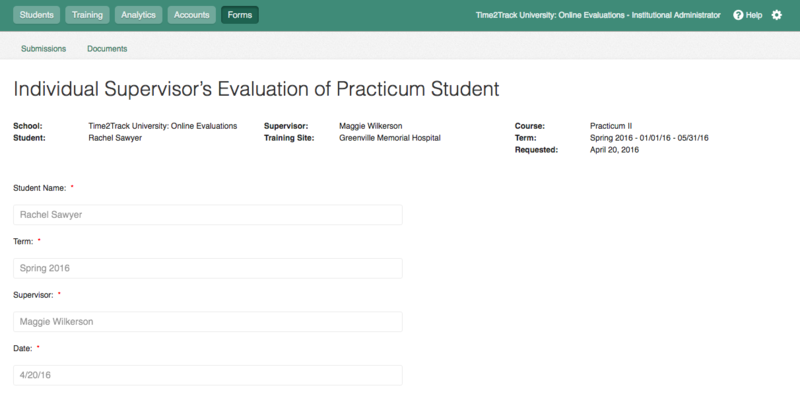 Online Forms is an add-on Time2Track feature that allows organizations to send forms to trainees and supervisors electronically through Time2Track. Supervisors and trainees complete the forms online, and the data is automatically entered into a database which can be exported at any time. No paper and no manual data entry required. Online Forms is an add-on Time2Track feature. Contact us to add Online Forms to your program's Time2Track account. Setting up Online Forms is a breeze. You'll work with a Time2Track representative to get your program's forms into Time2Track. 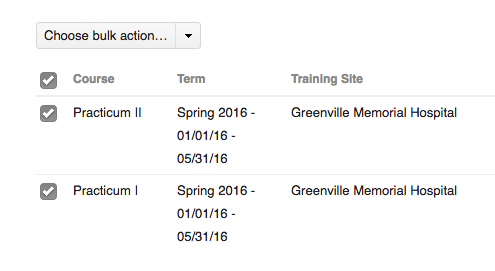 Once they're uploaded, you'll see the Forms tab appear in your Time2Track Institutional account. You can go to Forms then Documents to see a list of your forms. Click the name of a Document to preview it. If your forms appear correctly, you can begin sending them to trainees and supervisors. If any changes are needed, email your Time2Track representative or contact us. Once your documents are uploaded into Time2Track, you're ready to start sending them to trainees and supervisors. Go to Submissions. This area will show you a list of all placements that trainees have created in Time2Track and/or have hours submitted for approval. If a placement or trainee is not listed here, that means the trainee has not set up a placement. If a trainee has submitted hours to multiple supervisors at a placement, each supervisor will be listed in a separate line. 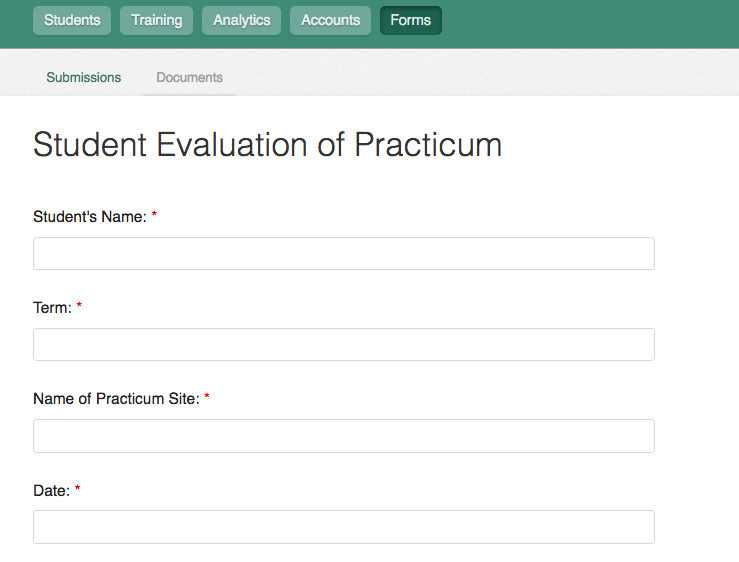 That way, you can send forms to all of a trainee's supervisors (or just one). To send forms, click the checkboxes for each trainee and/or supervisor you want to send forms to. You can click the top checkbox (beside Course) to select all the listings on the page. You can also use the filtering options to narrow down your list. 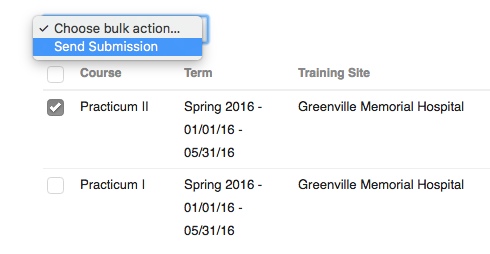 Select Send Submission from the Choose bulk action... dropdown list. In the popup box that appears, give your Batch a Name (eg. Spring 2016 Final Evaluations) and a Description (which is optional). Choose the correct Recipient Type (this would be the first recipient for multi-respondent forms with workflow), which will then show the forms that match that recipient type. Choose the correct Form Name, then click Send. An email notification will be sent to the recipient type you chose for each placement you selected. The email will contain a link that will take the recipient directly to the form to complete. Recipients can also access forms in the Forms tab in their Time2Track accounts. Click the paper icon next to a placement listing to view all the forms that have been sent for that placement. Once forms are sent, you can track their status as they are completed by their recipient(s). To check the status of a form, click the paper icon next to a placement listing in the Forms tab. Sent - Form has been sent to the first recipient. In Progress - The recipient (or first recipient for multi-respondent workflow forms) has started filling out the form and has saved their progress. In Review - The first recipient (multi-respondent workflow forms only) has completed their portion of the form and has submitted it to the second recipient. Submitted - The final recipient has submitted the form and it is now available for you to view. Approved/Complete - You (or another administrator at your program) have approved the form and it is now locked (recipients cannot unsubmit and edit). After a form status has changed to Submitted, you're able to view and approve it. Click the paper icon next to a placement listing in the Forms tab, then click View. Here, you can review the form responses by all parties and choose to print a copy if necessary by clicking Print. Click Approve to lock the form and prevent future changes (you can unapprove it later if needed, which will allow the recipient(s) to unsubmit and edit the form). 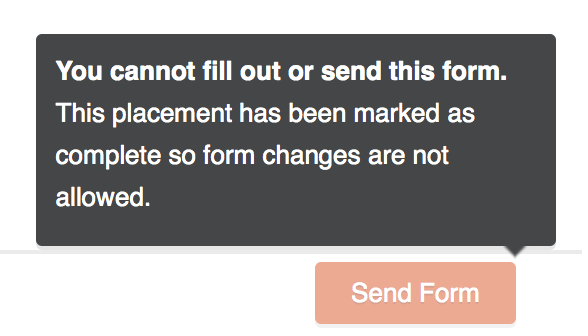 To resend a form, click the paper icon next to a placement listing in the Forms tab. Click the Resend button, which will send another email to the recipient reminding them of their pending form. If a recipient has not started completing a form yet, you can delete it. Click the paper icon next to a placement listing in the Forms tab. Click the X button to delete the form. 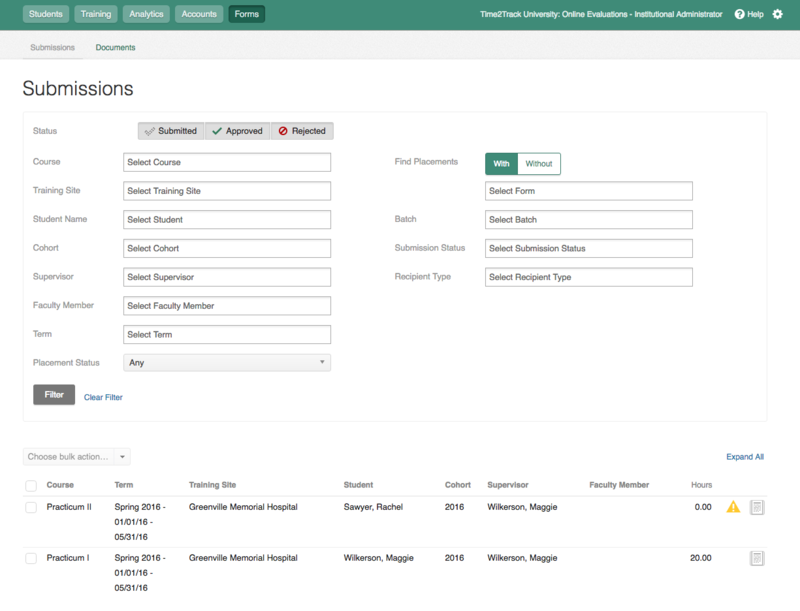 Setting up Course Forms will allow you to attach a form or forms to a specific course so that they are either automatically sent to the recipient or available for trainees to complete or send later. Go to Courses under the Training tab. 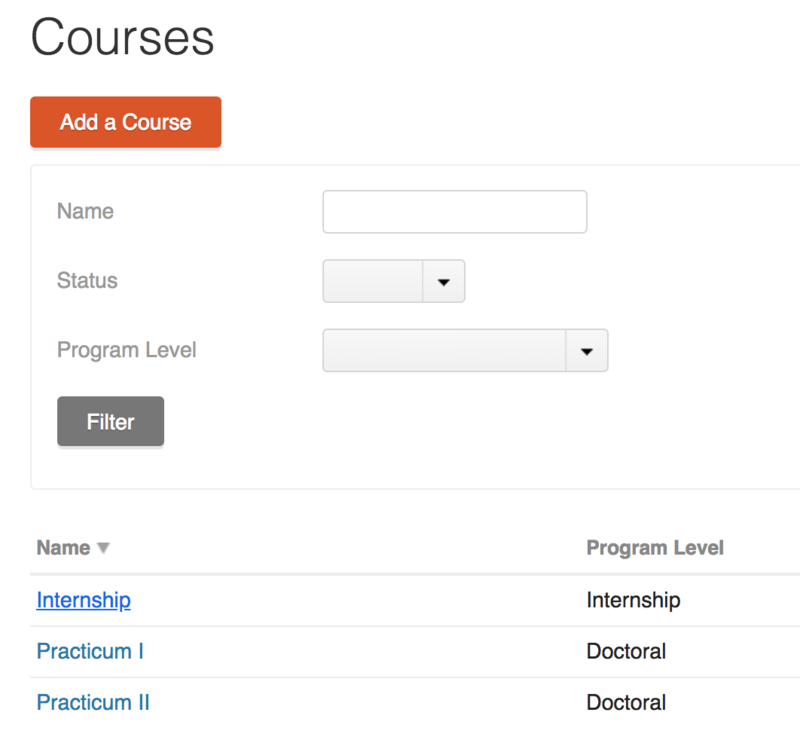 Click the course that you want to attach forms to from your list of courses. The course selected will display with a section titled Forms. The Forms section will list all of the forms that are in your account. To enable a form for the selected course, toggle the switch to the right side of the form. When the form is initiated, the active version of the form will be used. When the form is enabled, you can select the option of how you want the form to be sent. Required - Select this option if the form is required for the course and must be initiated by the student when the form is to be completed. 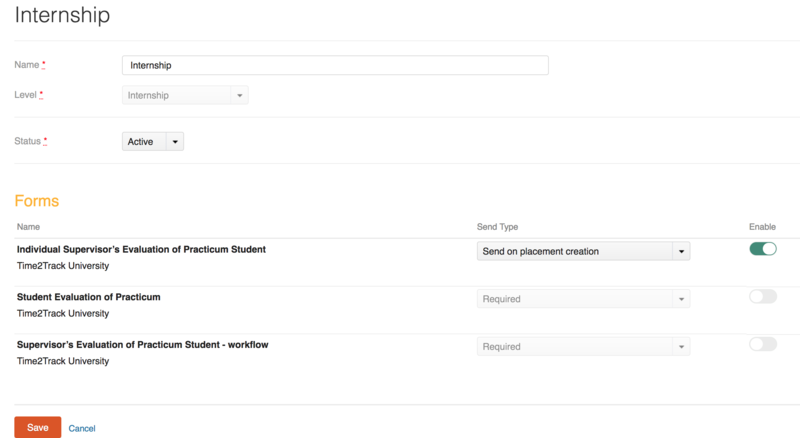 Send on placement creation - Select this option to automatically send the form to the recipient when a placement is created by the student. After you've enabled the forms for this course and set them up accordingly, click Save at the bottom of the page. Forms will only be sent for any new placements created in the future. 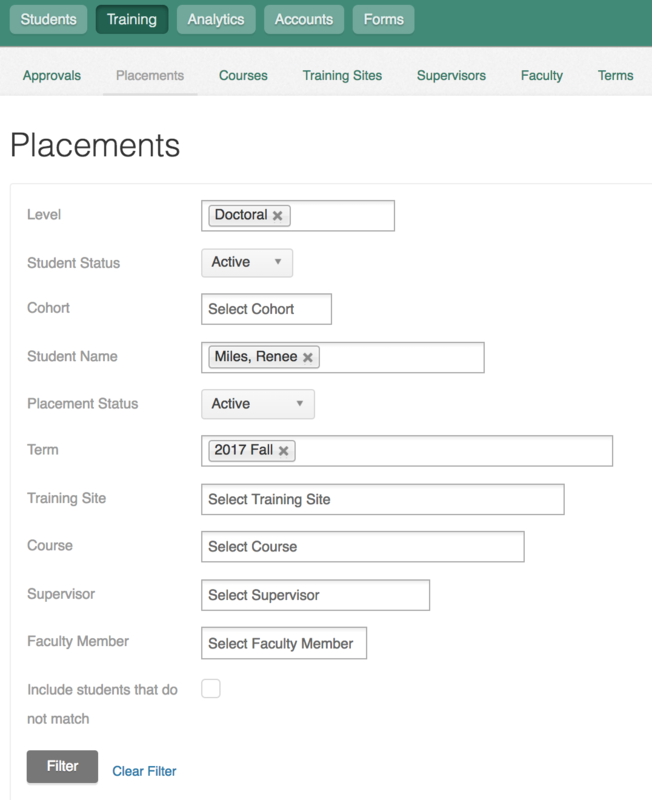 When forms are enabled for a course, that course will be added to the student's "Placement Forms" for any placement that has the course attached to it. If you want to prevent students from being able to fill out or send forms for old placements, you can mark the placement as complete. Go to the Placements sub-tab under the Training Tab. 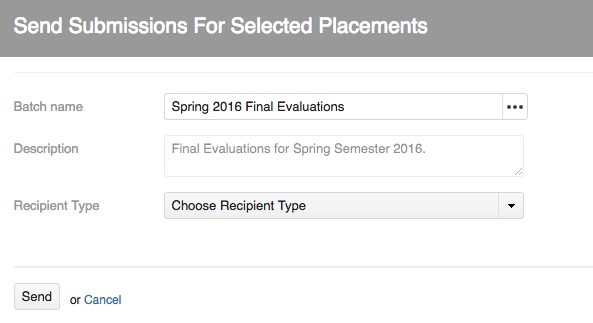 Select the filters that will help you locate a student's placement and click "Filter". When you find the placement(s) that you want to mark complete, click the box beside the placement(s) or click on the top box to select all of the placements in your list. Then on the pop-up screen, click "Complete".